Marc with Medal of Honor recipient Col. Jack Jacobs, MSNBC military affairs correspondent and author of the book "If Not Now, When? 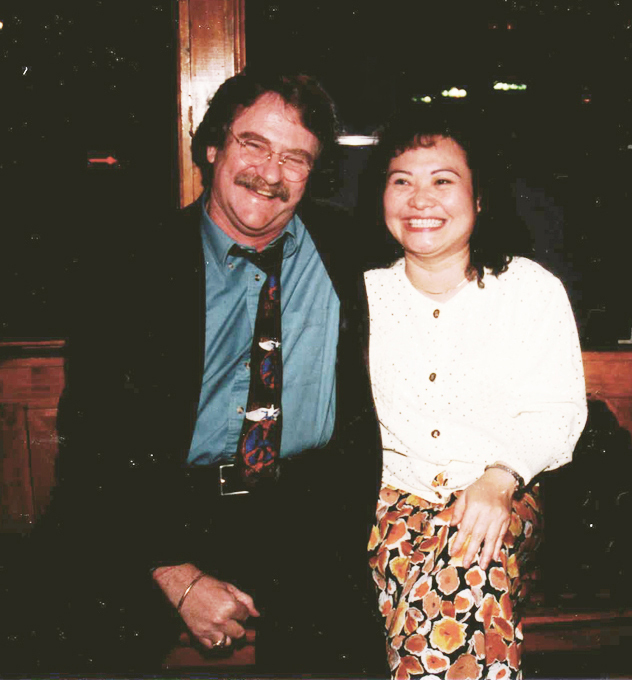 ", at Warner Bros. Studios in Burbank. 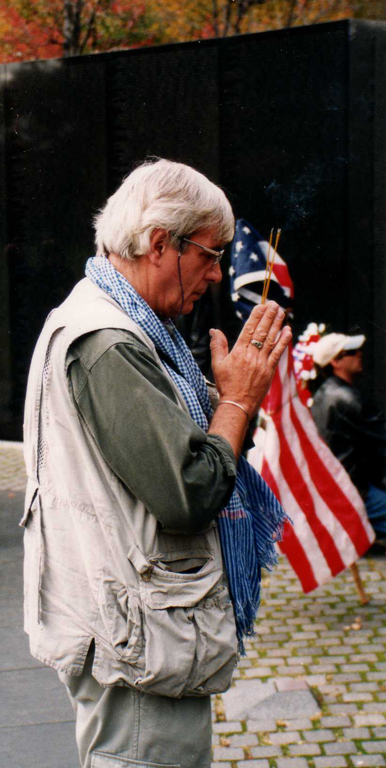 Renown British photojournalist Tim Page saying a prayer at the Vietnam Veterans Memorial Wall in Washington, D.C. in 1997. 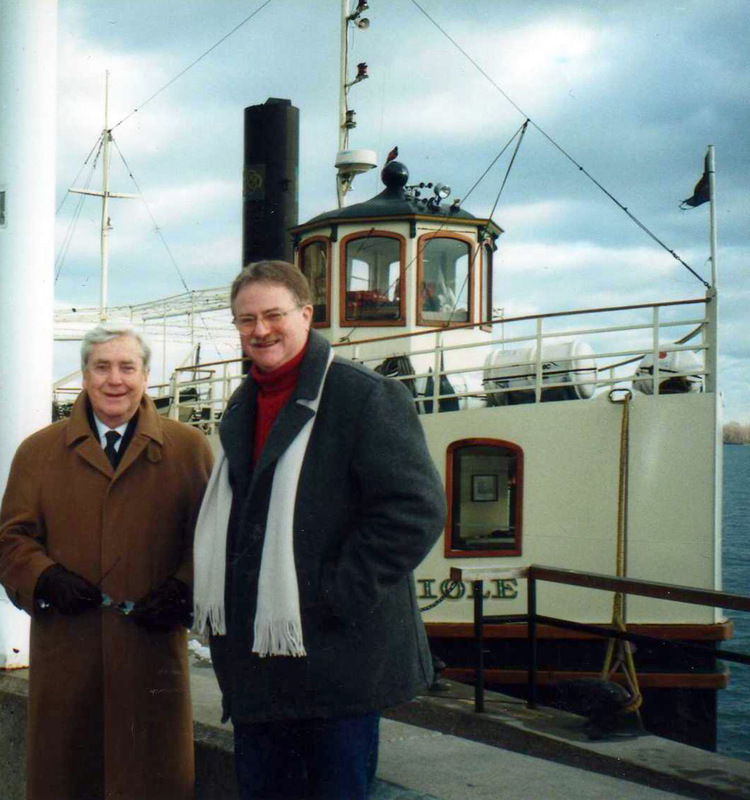 Marc with Bill Cunningham, who covered the Vietnam war for the Canadian Broadcasting Corp., at the Harbourfront in Toronto. 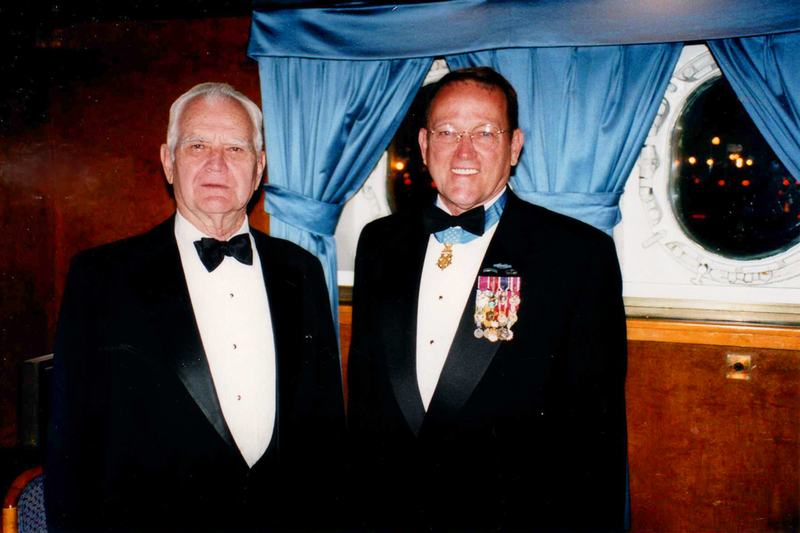 General William Westmoreland, Commanding General of the American forces in Vietnam, with Roger Donlon, first Vietnam veteran recipient of the Medal of Honor, aboard the Queen Mary where Special Forces threw General Westmoreland a birthday party. 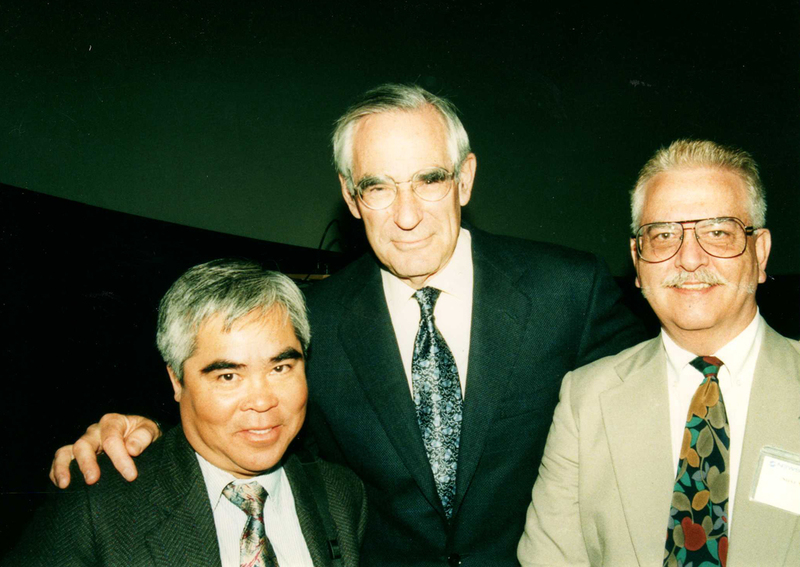 Associated Press photojournalist Nick Ut, who took the Pulitzer Prize-winning photo of Kim Phuc, "the Napalm Girl", author and former New York Times correspondent David Halberstam, and Steve Stibbens, who covered the Vietnam war as a Marine for Stars and Stripes, Leatherneck magazine and, as a civilian, for the AP. 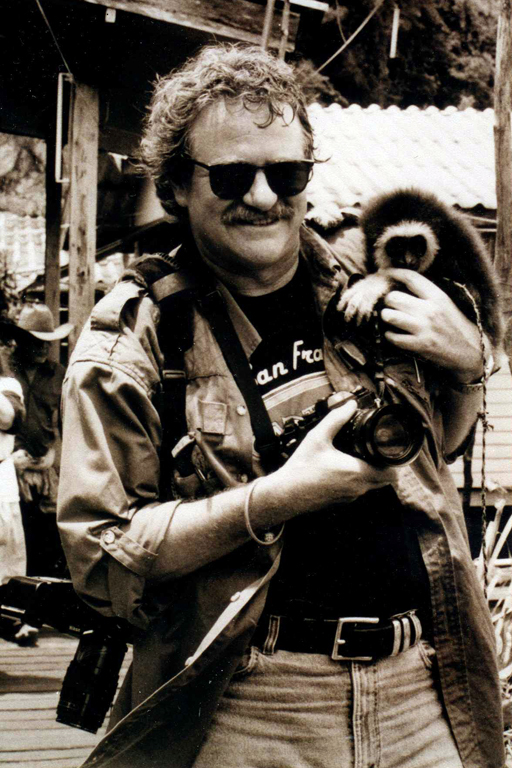 Marc with Kim Phuc, "the Napalm Girl", at the Chao Krung restaurant, Los Angeles, California (Marc Yablonka collection). 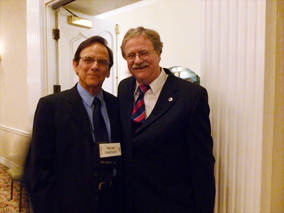 Marc with legendary actor Monte Markham at the 2012 Air America Association Reunion in San Diego. 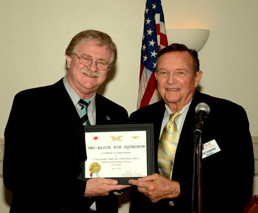 Monte's brother flew for Air America. Marc Yablonka receives a Certificate of Appreciation from CAPT Richard Zeisel, skipper of the Two-Block Fox Squadron of the Association of Naval Aviation. 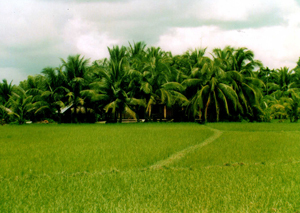 The luscious green of Vietnam as seen in Quang Tri Province. 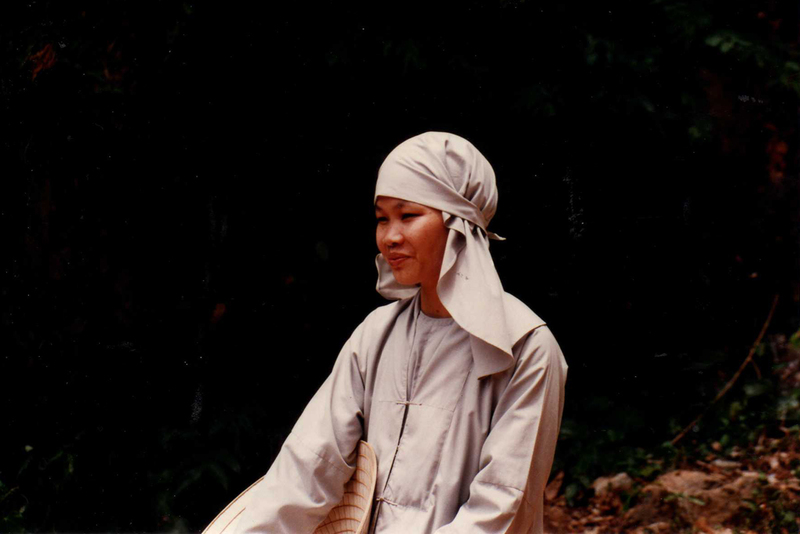 A reflective Buddhist nun at Marble Mountain, former clandestine Viet Cong stronghold, outside of Danang. 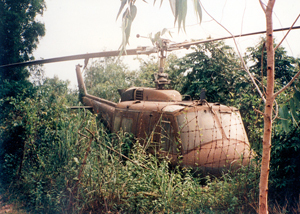 An American helicopter base was atop the mountain during the war, and American personnel had no idea the VC were underneath them. 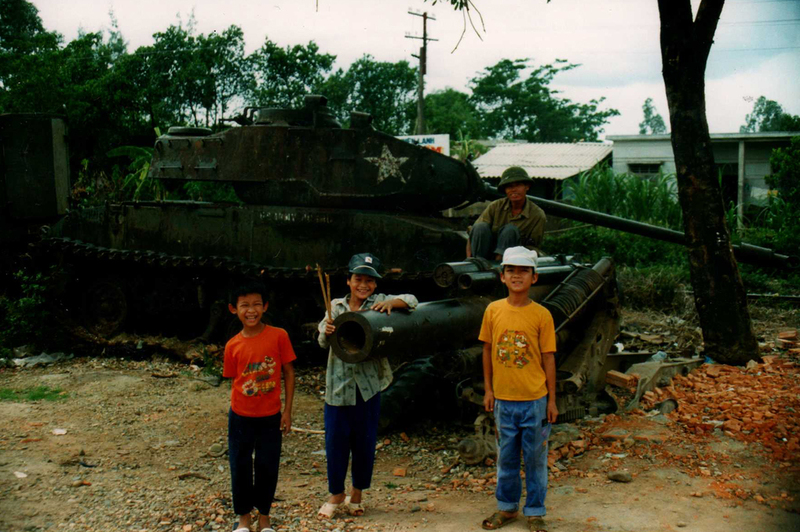 Kids play around a leftover relic of the Vietnam War-an American tank-while a watchful adult in a North Vietnamese Army pith helmet smiles on in the town of Dong Ha on the 17th Parallel dividing North and South Vietnam. 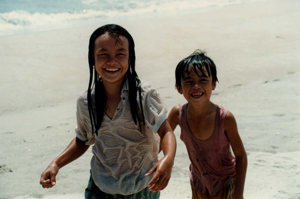 A brother and sister emerge from the waves at beautiful China Beach, former R&R location for American troops, just outside Danang. 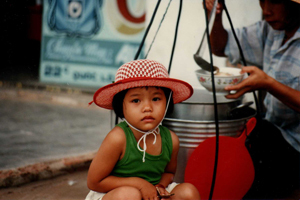 A young Saigonese child poses naturally for this photographer while her mother pours a bowl of pho, the famous Vietnamese noodle soup, for a passerby. Express bus speeds through Cholon, the Chinese quarter of Saigon. 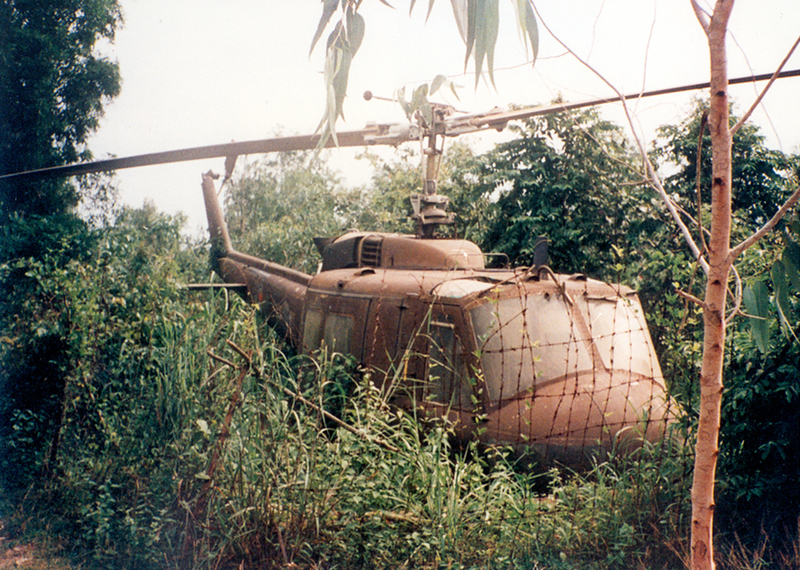 An abandoned Army Huey in the bush at Cu Chi, 15 years after the fall of Saigon. 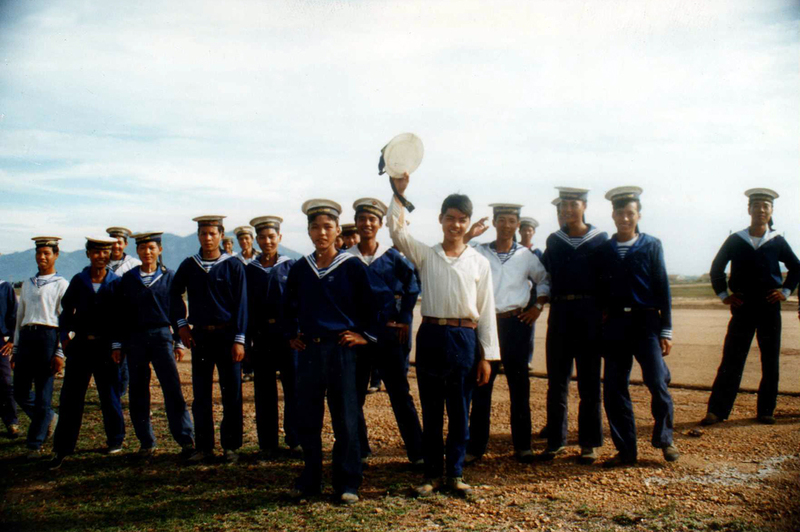 Young Vietnamese Navy recruits outside of Cam Ranh Bay. 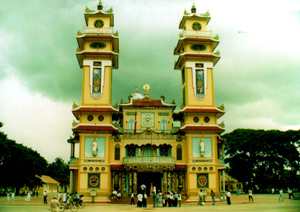 The Holy See, home of the mysterious Cao Dai faith, in Tay Ninh Province. Cao Dai is a weird confluence of Catholicism, but with three popes, female cardinals, and nuns all bearing the same first name, and Buddhism. 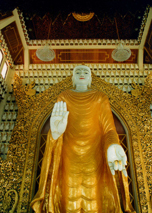 Its saints include Buddha, Jesus, Dr. Sun Yat Sen, and French writer Victor Hugo. Noon Mass in the nave of the Cao Dai Temple, Tay Ninh, Vietnam. 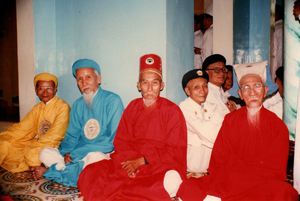 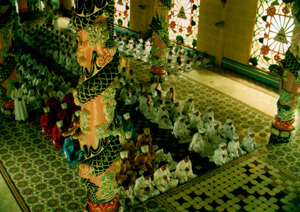 Elders of the Cao Dai religion at their temple in Tay Ninh. 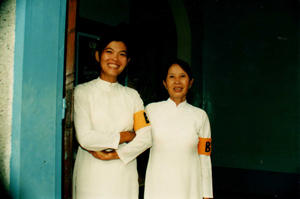 Two Cao Dai nuns after the Noon Mass at the Cao Dai Temple. 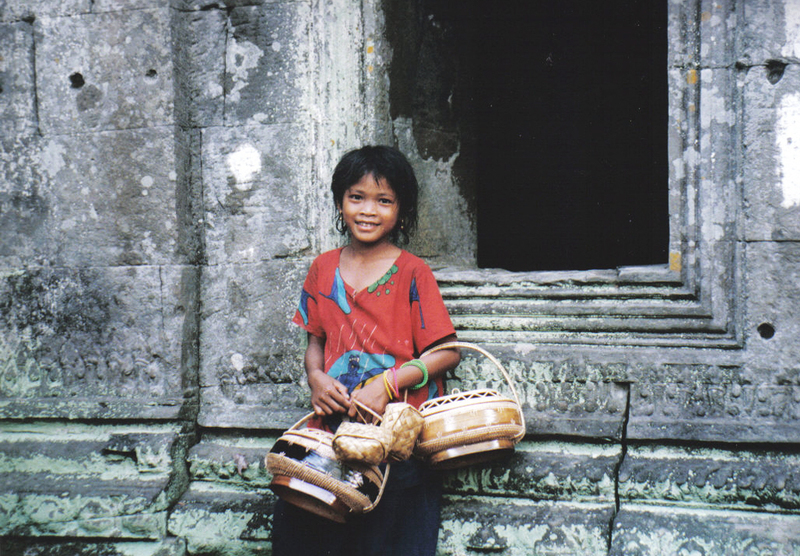 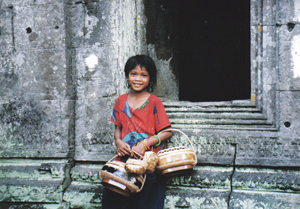 An enterprising young girl selling homemade baskets at Angkor Thom, part of the famous Angkor Wat complex outside of Siem Reap, Cambodia. Buddhist nuns at Wat Tmeay, Cambodia, all of whom had taken the vow of poverty after their husbands had been butchered by the bloody Khmer Rouge in the 1970s. 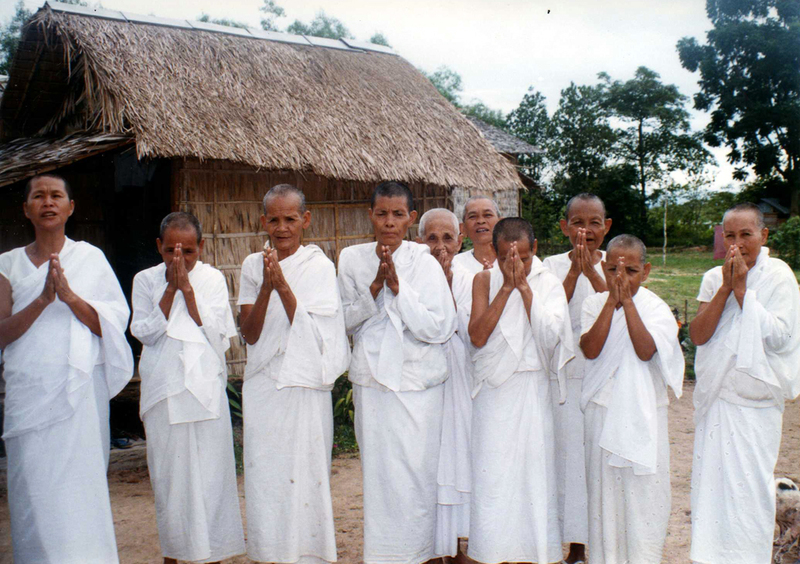 Their hands are raised in the Buddhist Wai, and they are chanting, right after this photographer gave them US$10; an amount, I later learned, which would keep them in plentiful rice for a month. 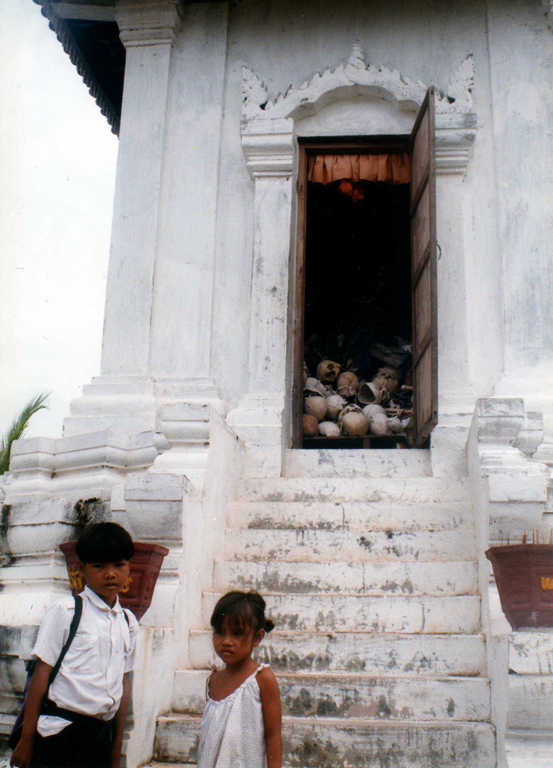 Cambodian school children at Wat Tmeay sizing me up as they stop in front of a Buddhist stupa, home to the skeletons of many of the village's citizens brutally tortured and killed by the Khmer Rouge regime. Buddhist stupa at Choeung Ek, 15 kilometers outside of Phnom Penh, which houses hundreds of the skulls of victims of Pol Pot's murderous Khmer Rouge cadres. 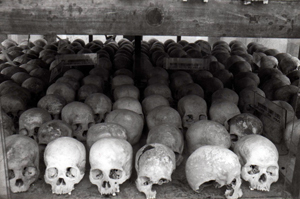 It has been estimated that they killed between one to three million fellow Cambodians. 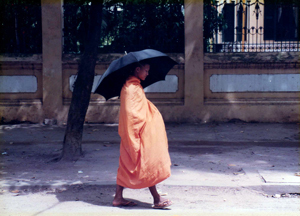 Buddhist monk walking by the women's prison in Phnom Penh. 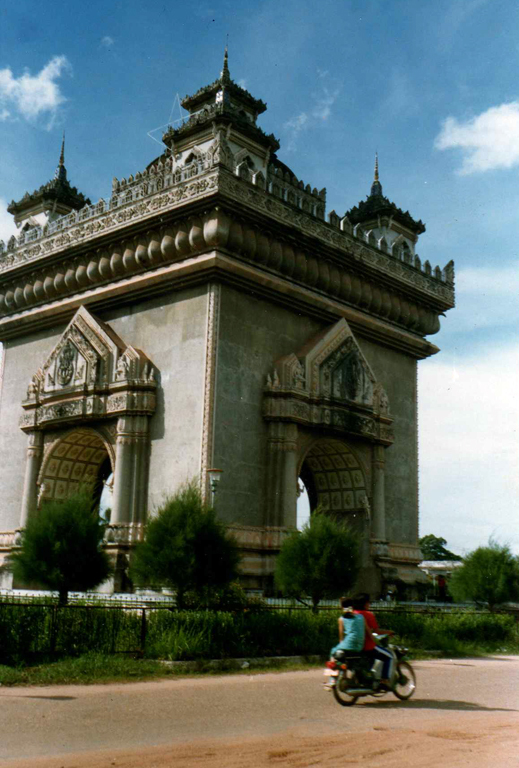 The Laotian "Arch de Triomphe" outside the capital of Vientiane. 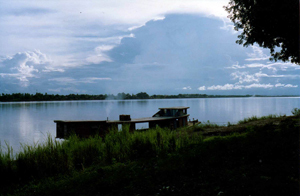 The Mekong River as seen from Vientiane, Laos. 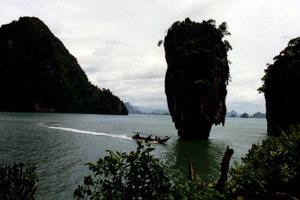 Thailand, a country thousands of Lao escaped to after 1975, lies directly across what seems to be a very peaceful Mekong. 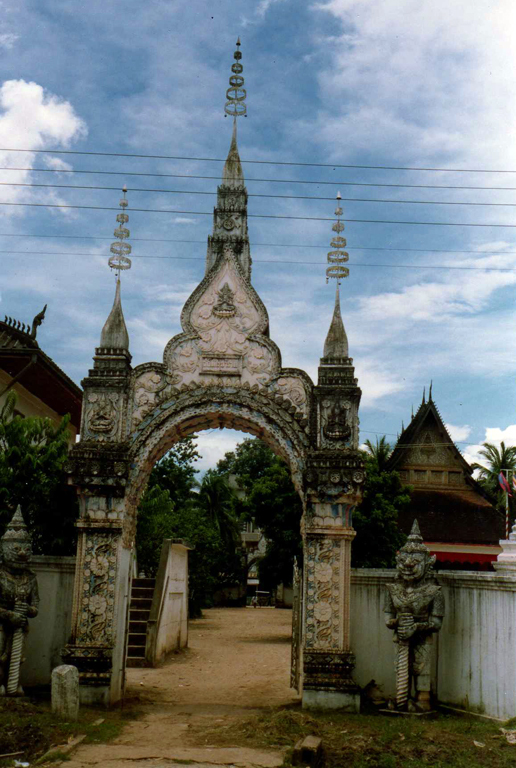 The gate to a Buddhist temple in downtown Vientiane, Laos. 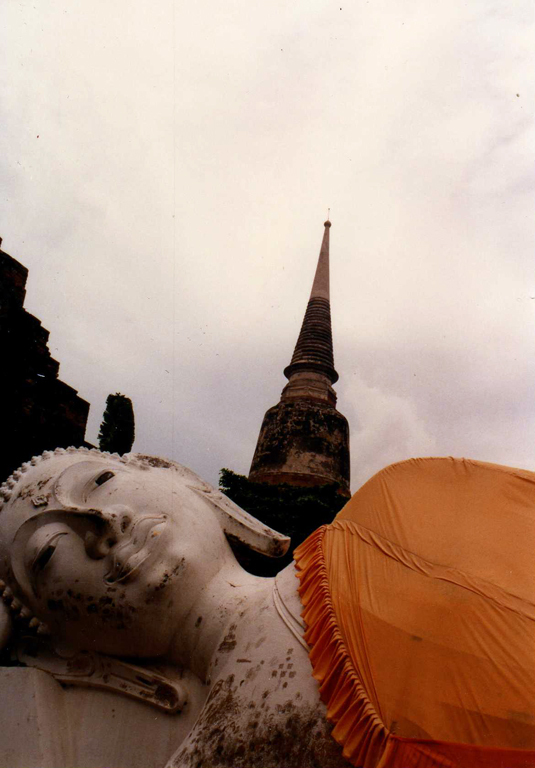 The town of 500 Buddhas, Ayutayah, Thailand. Phang Nga Island in the Gulf of Thailand. 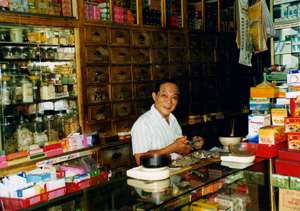 Gotcha! A young Thai girl apparently bathes and shampoos her hair fully clothed in the Chao Praya, downriver from Bangkok. 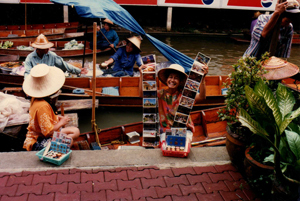 A happy postcard peddler at the famous Floating Market in Thailand. Buddhist temple on the Burma Rd., St. George, Penang Island, Malaysia. 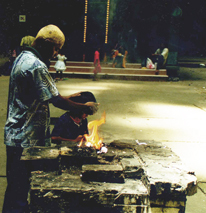 Batu Caves. A Hindu man is apparently applying heat from the fire in an attempt to cure whatever it is that ails his son. 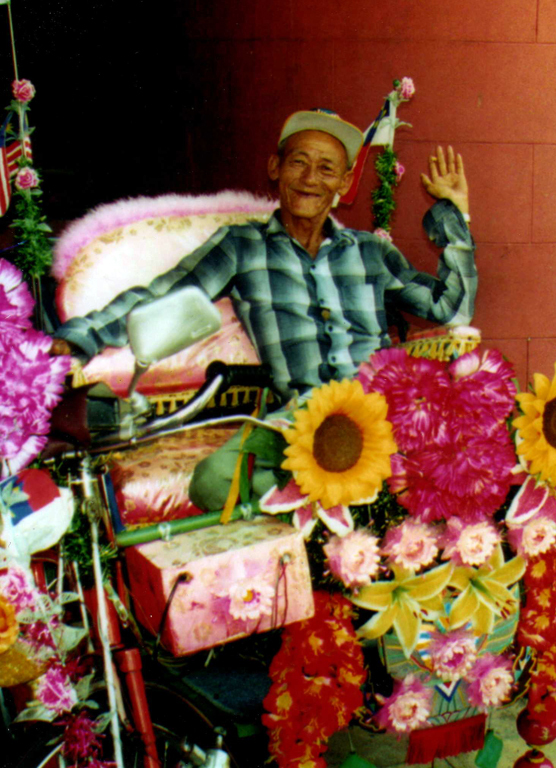 An eccentric, happy-go-lucky rickshaw driver in Malacca driving what has to be the goofiest pedi-cab in all of Southeast Asia. A smiling Chinese herbalist in St. George, Penang Island. 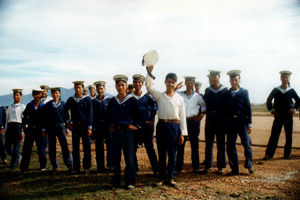 Two Malaysia Airlines pilots, Ibrahim in the right seat and Mohammed in the left, were kind enough to allow me into the cockpit of their 747 midflight. This was a few years before 9-11. 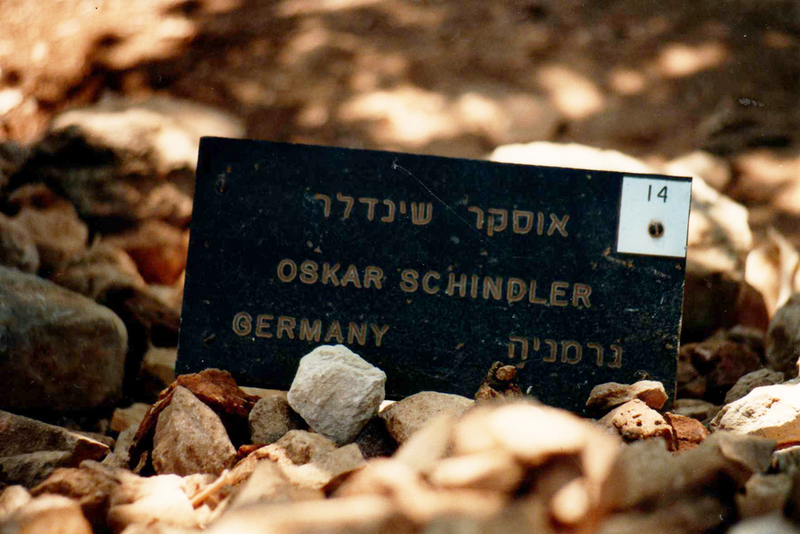 That would never happen today! 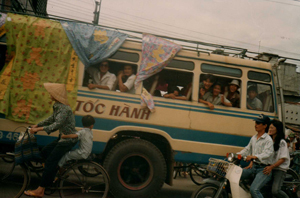 I was amazed at just how small the cockpit was for such a huge aircraft. 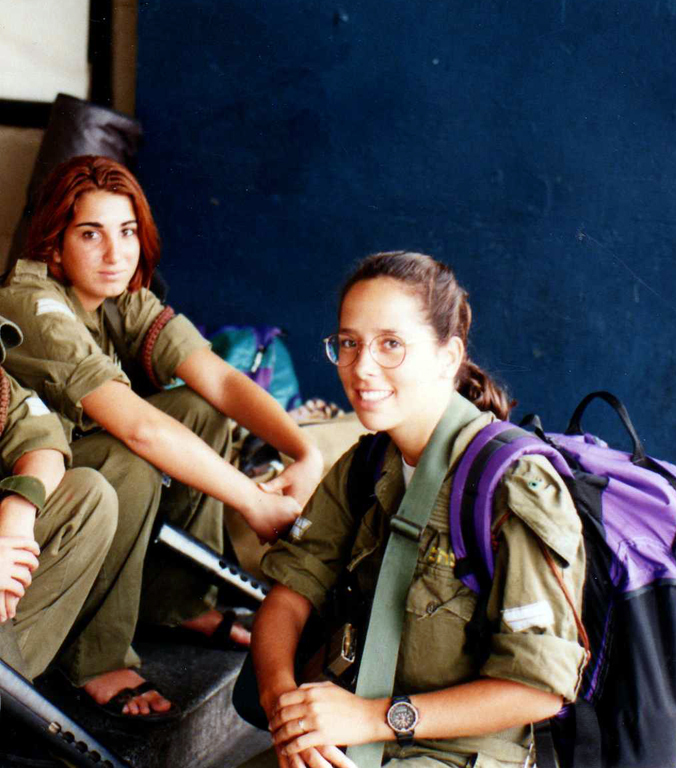 Female Israeli Defense Forces waiting for a bus in the Tel Aviv bus station. 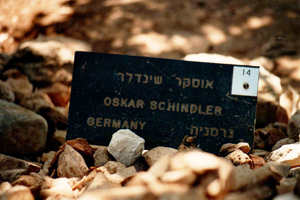 Oskar Schindler's plaque on the Path of Righteous Gentiles in Jerusalem. 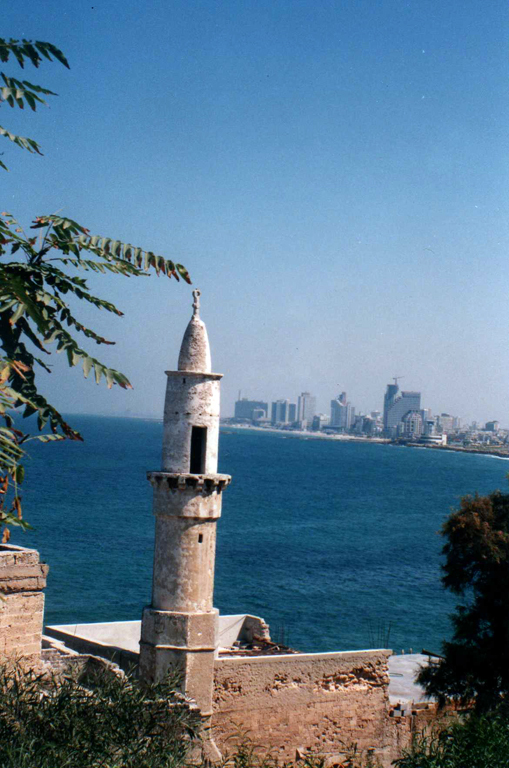 A Muslim Minaret in Jaffa. The cosmopolitan city of Tel Aviv lies in view. 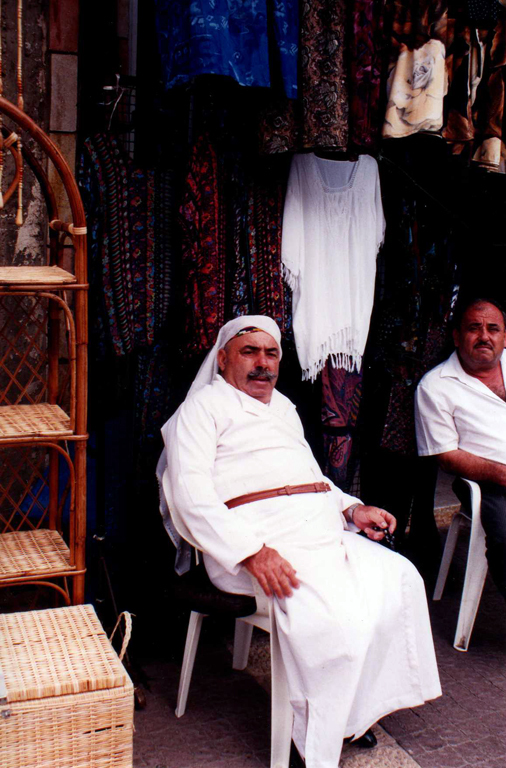 Arab shopkeeper in the Old City of Jerusalem. 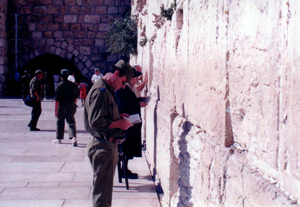 Israeli Defense Force troop prays at the Wailing Wall. 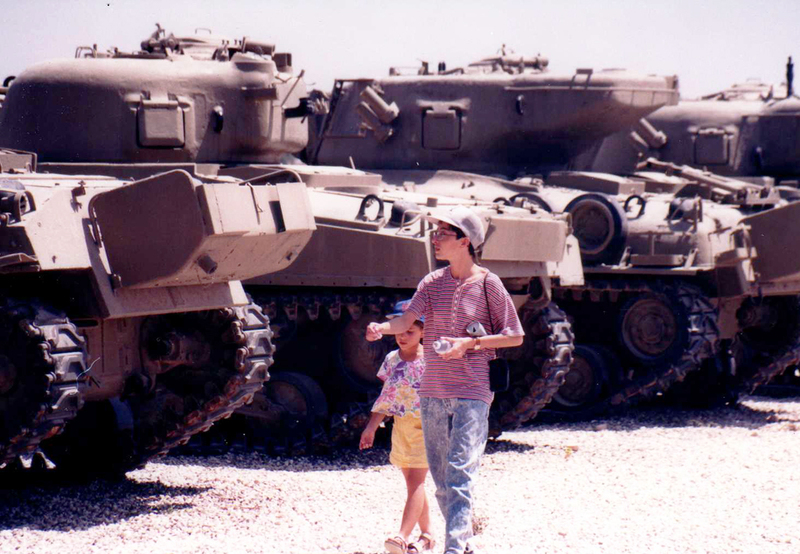 Children walk among the tanks at the Latrun Memorial to the tankers of the IDF. 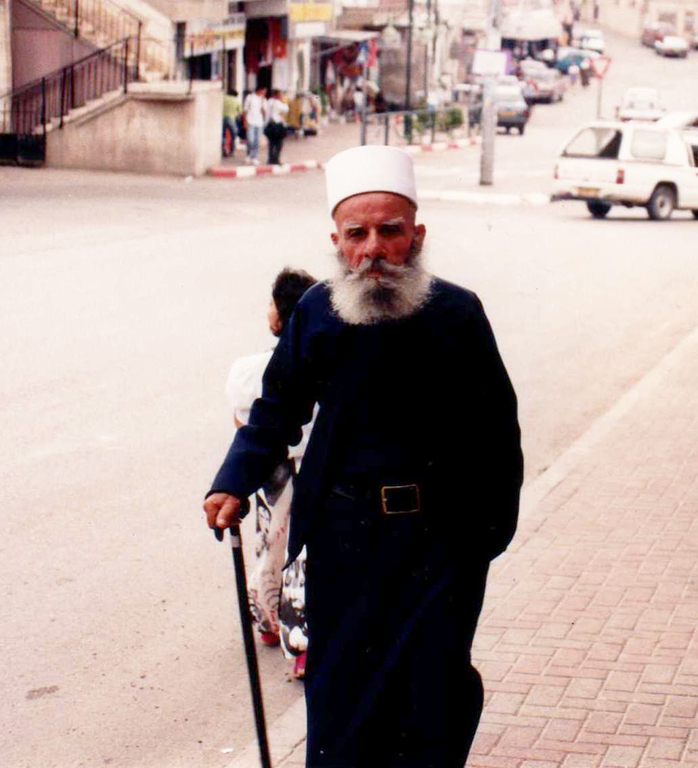 Druze elder walking in the streets of Haifa. 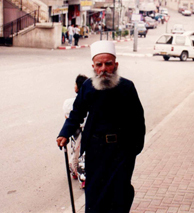 While Druze men are happy to have their pictures taken, women are forbidden, and will flee wildly at the sight of someone pointing a camera at them. 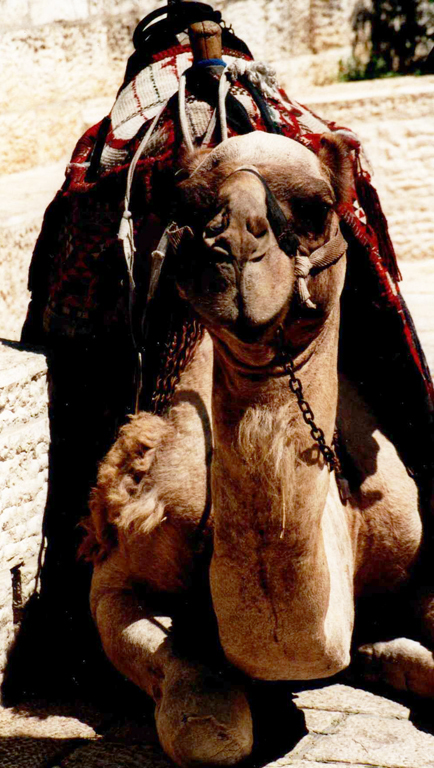 A camel at rest outside the Old City of Jerusalem.